Pakistan huffed and puffed their way to a 5-wicket win over Ireland, who were making their debut in Tests. Chasing a target of 160, they were in a spot of bother and tottering at 14/3. However, a patient and composed innings from Imam-ul-Haq ensured that they did not suffer the ignominy of losing to Ireland. They now face England in a 2 Test series commencing at Lords on the 24th of May. The 2 teams have played 81 Tests and England have won 24, lost 20 and drawn 37. In England, the two teams have contested 51 Tests with England winning 22, Pakistan winning 11 and 18 being drawn. Overall, the 2 teams have played 14 Test series in England, with the hosts triumphing on 7 occasions, the visitors on 3 occasions and 4 series were drawn. In the last 4 series in England, the visitors haven’t managed to register a series win even though they performed creditably in 2016 and drew the series 2-2. England will prove to be far tougher opponents than the Irish and are favourites to win the series. Pakistan will need to bring their A-game to win and they will also need the rub of the green. Here are 5 things they need to do to win their 4th Test series on English soil. In the past, teams from Pakistan have been embroiled in a number of off-field controversies, including alleged ball-tampering, spot fixing and a few other unsavory incidents. These kinds of controversies away from home tend to deflate visiting teams and make their already tough task even more difficult as the unrelenting media glare and criticism tends to put even more pressure on them. Even the spectators at the ground start heckling and booing the players and makes the players feel like the whole world is against them. The Pakistani players need to remain unflappable and not give in to provocation, no matter how severe. Let Mohammad Amir lead the attack. In the early part of the summer, the pitches in England will aid pace bowlers, with the spinners unlikely to get much purchase. Among Pakistan’s pace bowling quartet, which took the field against Ireland, only Amir and Rahat Ali have played Tests in England. Rahat has taken just 8 wickets in 3 Tests in England at 50.87 and is extremely expensive, conceding 3.83 runs per over. Amir has a good record in England, taking 42 wickets at 26.26, but has been underwhelming since he returned from his ban, taking just 49 wickets in 17 Tests at 34.91 with a strike rate of 77.2. These are hardly inspiring figures for someone who promised so much so young. While it isn’t easy for any bowler after a 5-year layoff from international cricket, Amir needs to put his hand up and lead the way, as Mohammad Abbas and Faheem Ashraf haven’t played a Test in England. In both of Ireland’s innings, the hosts were reeling at 36/5 and 127/5 and still went on to score 130 and 339 respectively. England have a lot more depth in batting than Ireland and they will make the visitors pay heavily if they take their foot of the pedal. Make sure the top order fires. England’s bowlers are a lot more experienced than Ireland’s and it is asking too much of Pakistan’s lower order to expect them to bail the team out of trouble again and again. If you consider Tests in England since 1st May 2008, the average runs per partnership for Pakistan for the first 5 wickets is just 28.25. This is the 2nd lowest among all teams that have played in England during that period, just marginally ahead of India who average of 28.16. Against Ireland in their first innings Pakistan’s last 3 wickets added 151 and in the second innings they were reduced to 14/3. Only the inexperience and lack of depth in the Irish bowling attack enabled Pakistan to get out of jail. The visitors cannot expect the same leniency from England’s attack if they were to suffer a similar collapse. The top order need to apply themselves and score more runs. This is just a 2 Test series. A loss in the 1st Test means that the best possible outcome will be to square the series. These days, the packed schedule means that visiting teams do not get much time to acclimatize to conditions. 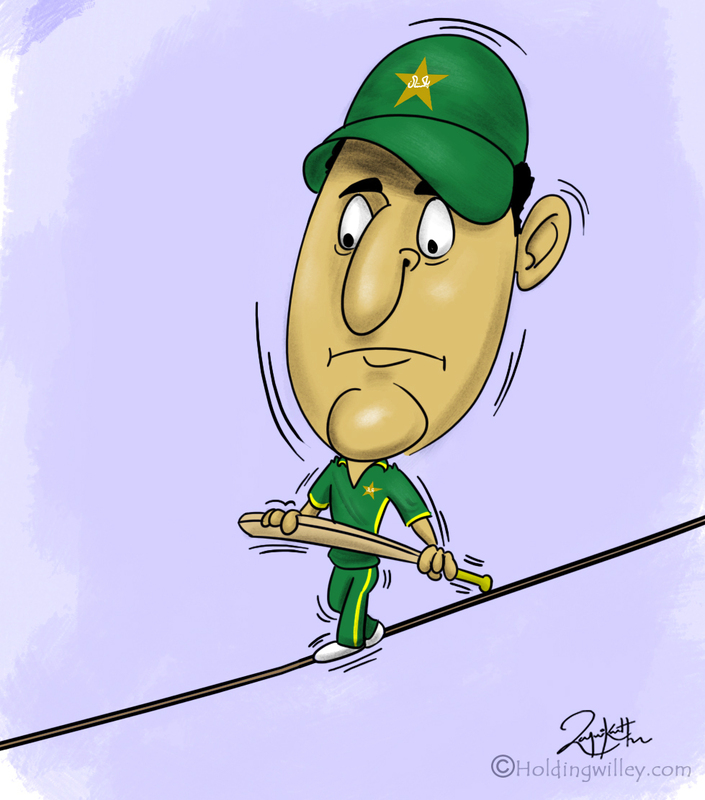 Even though Pakistan have played 2 practice matches, they cannot afford to get off to a slow start. They need to hit the ground running and be quick of the blocks. The 1st Test is crucial. In the 3 series in England where Pakistan emerged victorious, they drew the 1st Test twice and won once. In the 7 Test series in England where they lost, they have lost the 1st Test on 4 occasions and drawn the 1st Test 3 times. This shows how significant the 1st Test is to their fortunes. Target England’s wobbly, out of form batting. During England’s disastrous twin tours to Australia and New Zealand, only Joe Root averaged above 40 with the bat and even he averaged just 43.33. Alastair Cook struggled and averaged just 33.25 and Jonny Bairstow scored 469 runs at 36.07. If you take away Cook’s unbeaten 244 at the MCG, his average in 12 innings was 14.09. With both their main batsmen in poor form this is an ideal opportunity for Amir and company to make inroads in England’s top order. Jos Buttler hasn’t played Test cricket for England since December 2016 and First Class cricket since September 2017. Even though he has been in scintillating form in the IPL, he will understandably be rusty and nervous when he returns. Pakistan need to capitalize on the disarray in England’s batting line-up to win the series. Bonus factor: England’s bowling may struggle apart from James Anderson and Stuart Broad. If you consider Tests in England since 1st May 2008, James Anderson has taken 288 wickets at 22.91 and Stuart Broad has 252 wickets at 27.12. Both these bowlers are almost unplayable in conditions that favour swing and seam. Even though they are past 30, they will be a handful at home. However, Mark Wood has just recently recovered from injury and Ben Stokes bowled only 10 overs in 2 Tests in New Zealand. Chris Woakes took 10 wickets in 5 Tests at 60.2 in the winter tours to Australia and New Zealand. This is an area that the visiting batsmen can look to exploit. They should play Anderson and Broad with caution, without losing too many wickets, and look to feed of the remaining bowlers. The uncapped off-spinner, Dominic Bess, should not pose too many problems and may not even make the playing XI.